Broadway star Louanne (Mackaill) is retiring from the stage to marry a society gentleman. However, he doesn’t know her colorful past, which she shares a watered down version to the press. Throughout her scandalous past of hula dancing at honky tonks in the Congo and dancing at a carnival show, Wally (Fay) was with her the whole time, who is in love with her. On the eve of her marriage, someone from her past shows up in the audience. A group of actors travels across the country, touring their show. 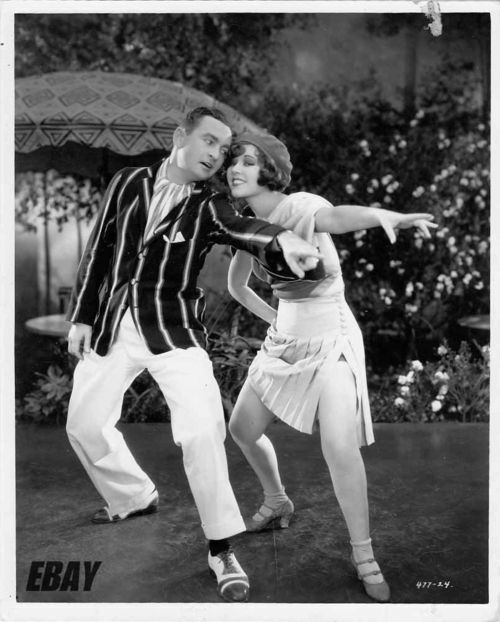 Carlie (Love) is in love with her vaudeville partner Terry (King), who falls in love with every leading lady. -The original released included a two-strip Technicolor finale, which is now lost. As I have noted before, musicals made shortly after the dawn of sound can be haphazard. Songs may be thrown in or randomly performed that don’t seem to fit in with the plot and dance numbers can be clumsy. However, “Chasing Rainbows” is an exception. The mix of song and plot are done a little better in “Chasing Rainbows.” Perhaps it works better because the lead characters are in a musical show. So some songs are their performances, and others are to the person that they love. What’s interesting is that our two leads, Charles King and Bessie Love, were both mainly done with Hollywood in 1931. Bessie Love’s career picked back up in 1950, when she started playing small roles in film and TV, but nothing at the caliber she was once at. The actors that went on to be the biggest stars were the supporting characters: Marie Dressler and Jack Benny. However, this footage is lost and the movie ends abruptly. Bessie Love runs out of her dressing room and the movie ends. It would have been amazing to see that number that is now lost. It is also curious that the film preservationists chose not to add a photo still with a song playing over it, like is done in so many films with lost portions. But perhaps that wasn’t an option. Dixie Dugan (White) is in a failed Broadway show, “Rainbow Girl.” She meets director John Buelow (Miljan) who gives the illusion that he is high powered in Hollywood and convinces her to leave New York to pursue a Hollywood career. Unsurprisingly when Dixie gets to Hollywood, she is now welcomed with open arms. Dixie befriends a “has been” actress Donna Harris (Sweet), who tries to warn her and show her the ropes. Dixie’s boyfriend (Mulhall) who wrote the failed Broadway show is invited to Hollywood to make “Rainbow Girl” into a film. Dixie is cast, but stardom goes to her head. -The finale reel was filmed in Technicolor but this print no longer survives. -This film follows Show Girl (1928) where Alice White plays Dixie Dugan. It is followed by “Dixie Dugan” (1943) where Lois Andrews plays the role of Miss Dugan. A few weeks ago, I reviewed Alice White’s first talkie, “Broadway Babies,” which I thought was only mediocre. “Show Girl in Hollywood” is perhaps slightly better but still rather bland and clumsy. I also still don’t feel endeared to Alice White. She’s cute and spunky but she just isn’t a great actor. Probably the best performance in the film comes from Blanche Sweet, who I wasn’t familiar with prior, but her film career began in 1909. Sweet’s character tells Alice White that Hollywood no longer wants you after age 30 and not to take success for granted. Unfortunately, life seems to imitate art here, as Sweet only made one more film in 1930. Sweet retired in 1935 when she got married and would not make another film or TV appearance until 1958, the same year her husband passed away. “Miss Sweet plays her part so well that she puts Miss White in the shade,” wrote New York Times film critic Mordaunt Hall in his May 5, 1930, review. Rather than the actors and main characters, the setting is the most interesting aspect of this film is the “behind the scenes” feel of Hollywood. It’s one of those Hollywood films about Hollywood, which are usually fun. We see a film being edited, the light crew, the cameras rolling, giving the audience a feeling that they are being let into how Hollywood works. Dixie even ignores the red filming light, walks onto a sound stage, to see a gangster film being shot. Two men are struggling and it looks like one is about to go out a window, then Dixie walks up and appears in the window the man is about to fall out, ruining the shot. This showed audiences how films were made. We end with a Graumann’s premiere with cameos from actors like Loretta Young and Al Jolson with actress and wife Ruby Keeler all giving glowing remarks about the fictional film, “Rainbow Girl. These cameos are the most exciting part of the film. I hadn’t read ahead about the film so the cameos were a surprise and a treat. If you enjoy (what the kids today call) a “meta” film, take a look at this one. The behind-the-scenes film is interesting, but the actual story and lead actors are not. Roy (Kaley) is a jerk of a songwriter who uses his old romances and love letters as inspiration for his songs. He even attempts to capitalize off his friend’s death through a song. Saxophone player Rudy Bronson (Vallee) forms a jazz band. To get off the ground, he and his band go to the home of famous bandleader Ted Grant (Waite) for an audition. Grant isn’t interested and kicks them out of his home and then heads out of town. Grant’s neighbors Jean Whitehall (Blane) and her aunt Ethel Bertha Whitehall (Dressler) mistaken Rudy and his band for Ted Grant. Rudy and his band play along but find themselves in hot water when they’re presented at a society fundraiser as Ted Grant and his band. “The Vagabond Lover” is both an early film with sound and also Rudy Vallee’s film. It’s interesting to see this early film to see how both musicals and Rudy Vallee acting improved. It’s very obvious that studios are still trying to figure out hot to best use sound. While the story line is less muddled than films like “Broadway Melody of 1929,” the sound volumes are often muddy. Sometimes the music is louder than the singing or talking, and other times I feel like the actors are shouting to be picked up by the microphone. In his first film, Rudy Vallee isn’t a very good actor. But he apparently improved his acting craft over the years because Vallee was a skilled comedic actor in the 1940s and 1950s. “Vagabond Lover” is just over an hour-long. It’s not terrible, but rather lackluster. Marie Dressler is wasted in the film and doesn’t exercise her comedic talents. Sally Blane is lovely, but is merely window dressing in the movie. Overall, it’s watchable but not one I would be pressed to revisit. There is a lot of romantic trouble as the Reynolds family vacations at a seaside resort. Peggy Reynolds (Clyde) is unhappy with her philandering parents (Nella Walker, Albert Gran) who are both carrying on with people closer to Peggy’s age than theirs. More romantic trouble occurs as Peggy’s sister Janet (Blane) is dating Clinton Darrow (Burns), who is only interested in the Reynold’s family money. Peggy is dating Bill (Lake), who constantly proposes and she refuses. Peggy decides she needs to fix her family. But things get even more messy when Mr. Reynolds buys stock from his mistress, Mrs. Lyons-King (Reiver) and Clinton blackmails Janet over love letters. When Peggy tries to save her sister’s reputation by taking the letters from Clinton’s room, Janet thinks her sister is stealing her boyfriend and Bill thinks Peggy is cheating on him. The musical portion of this film comes in as the actors rehearse for the resort’s charity show. -Actress June Clyde’s first credited film role. The former vaudeville star was supposedly selected for the film because of her nice legs, according to “The First Hollywood Musicals” by Edwin M. Bradley. -Actress Olive Borden was supposed to star in the movie but was replaced by June Clyde, according to “Olive Borden: The Life and Films of Hollywood’s Joy Girl” by Michelle Vogel. -Pianist Oscar Levant, who later starred in several films such as “American in Paris” (1951), wrote several of the songs for this film. -In the first minute, as the camera pan the beach, a man is dancing with a mermaid. Director Busby Berkeley is frequently credited as “saving the movie musical.” Berkley’s elaborate kaleidoscopic-like dance numbers set to tunes written by Al Dubin and Harry Warren graced movie screens in the early 1930s. Before that, movie musicals were frankly a mess and were quickly losing popularity. Take “The Wedding of the Painted Doll” number from “Broadway Melody” (1929). A mess. Seriously. The number starts with two girls dancing and all of a sudden more and more and more dancers come on stage until there are maybe 40 dancers. The number of people isn’t unusual, except everyone is flailing and doing their own thing– from pirouettes across the stage to cartwheels to high kicks. This wasn’t unusual before Berkeley figured out how to make musicals work with the dawn of sound. “Tanned Legs” is not quite as bad when it comes to musical numbers, but you can certainly use it as a gauge of how movie musicals evolved into something much more sophisticated even three years later with “42nd Street” (1933). In the first number called “Come in the Water, the Water Is Fine,” the camera man starts out about 50 to 100 feet away from the stage. I think it was supposed to be like a person watching from the distance, and then moving closer. As the camera gets closer, June Clyde is just standing and singing and girls are doing odd (and sloppy) sumersaults behind her. They aren’t even together. They all lay down, lifting their legs in a sequence, but not together. The plot is about as mediocre as the musical numbers but is rather charming in the “1920s flaming youth” sort of way. For me, the biggest treat was seeing Sally Blane, sister to Loretta Young, and Ann Pennington in a film- it was actually the first time I had ever seen either actress perform. If you are looking for terrific acting, fascinating musical numbers and catchy songs- this movie really isn’t for you. But you have to keep in mind that this talkie is very early in the dawn of sound period- so they were still learning. If you are looking for a time capsule into film history, 1920s flappers and the evolution of movie musicals, this may be more for you.